Thanks to British ex-pats everywhere, tired and thirsty tourists can be sure to find a pub on a cold and wet day anywhere. So after purchasing a container of Hungarian paprika just as Budapest’s Nagycsarnok marketplace was closing and the rain was starting, there, conveniently positioned across the way, lay a comfortably cozy pub where I could take a load off and consider the next course of action. 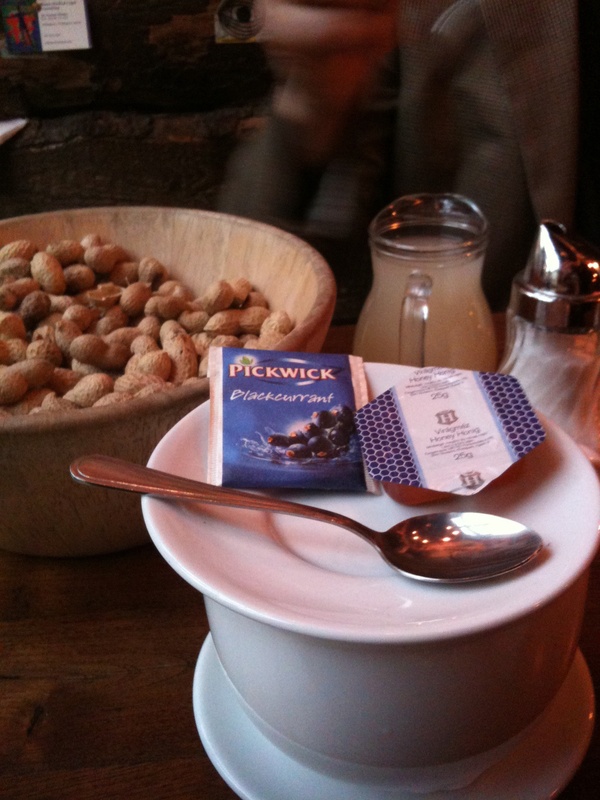 Now, firstly, Pickwick tea is not technically English, it’s Dutch. And secondly, pubs anywhere on the globe feel English regardless of where you find them. This Hungarian pub, however, was memorable not for its beer or food selections (I didn’t eat except for the large bowl of shelled peanuts on each table), but rather for its plethora of (mainly) business cards plastered and pinned all over the cork and wood paneled walls. And for that large bowl of shelled peanuts on each table. After ordering my blackcurrant tea, I couldn’t well resist digging into the big bowl of peanuts but wondered where to place the shells after cracking. Before long I discovered that that is what the floor was for. So for the remainder of the Day 1 sightseeing recess, I laughingly fought off the urge to leave the shells on the table (especially after the waiter, on one of his visits to my table, swiped the small pile of accumulated shells onto the floor). And that’s today’s lesson in letting go…. This entry was posted in Budapest and tagged Budapest, Eastern Europe, Rain. Bookmark the permalink.